EPIX was founded with the tagline “We Get BIG Movies” and was early in its adoption of broadcasting and streaming HD video. As the adoption of 4K Ultra HD has now hit some critical inflection points in the US (100% of all large-format TVs sold are now 4K, 4K TV sets being sold for <$300, etc) EPIX was ready to enter this new area and provide an even greater experience for its distribution partners and its viewers. 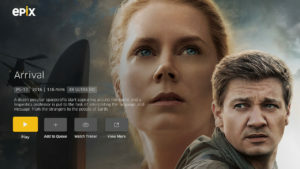 First unveiled in February of 2018, EPIX became the first US premium network to stream 4K Ultra HD content to its users. 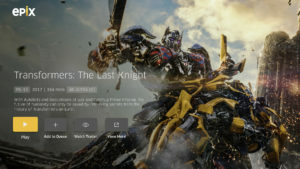 Launching first on Apple TV, EPIX began streaming Hollywood hit movies in glorious 4K Ultra HD with Dolby Digital Plus audio including titles such as The Arrival, The Magnificent Seven, Star Trek Beyond and Transformers: The Last Knight. In addition, EPIX distributed 4K movies through its Pay TV partners including DISH Network and Layer3. 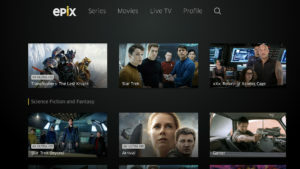 In doing so, EPIX became the first premium TV network in the US to stream 4K Ultra HD through its own apps, and through Pay TV distributors. This event has been considered a key industry milestone in the rollout of 4K Ultra HD technology for consumers. To achieve this industry first was a massive undertaking across many areas, exacerbated by how bleeding-edge 4K streaming truly is. Technically it required EPIX to encode video in 11 different renditions and resolutions, with the highest bitrate being up to 21 Mbps. Fine-tuning the appearance of our content across myriad TV devices required many video experiments to optimize quality and resolution with various compression techniques and bitrates. Many members of the team also tested the content at home to analyze quality on various TV panels over different broadband speeds. If it were easy to do, EPIX probably wouldn’t have been the first!